Judging by the outrageous artwork that accompanied Thee Oh Sees’s single “The Lens” last month, it’s no surprise the corresponding video is equally bizarre. Directed by Alex Theodoropulos, it’s a totally wacky and technicolor journey through an alternate universe, as seen through the eyes of a brave and curious astronaut. I use the term “alternate universe” rather loosely here, because I kind of have no idea WTF is going on — I just know that I can’t take my eyes off these visuals. Suffice it to say the clip features floating babies, a svelte and naked Avatar-like female, and random penises sprouting up from the ground. Yeaaah. 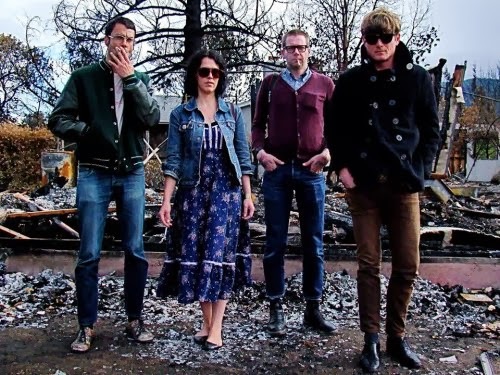 Eerily enough, it suits the Bay Area band’s melancholy track to a T.
California psych-garage favourites Thee Oh Sees gave their fans panic attacks a couple of months ago after announcing a hiatus, in part instigated by leader John Dwyer’s move from the Bay Area to Los Angeles and years of touring. The band promised a new album was on the way, though, and have now confirmed that their Drop will, well, drop this spring.